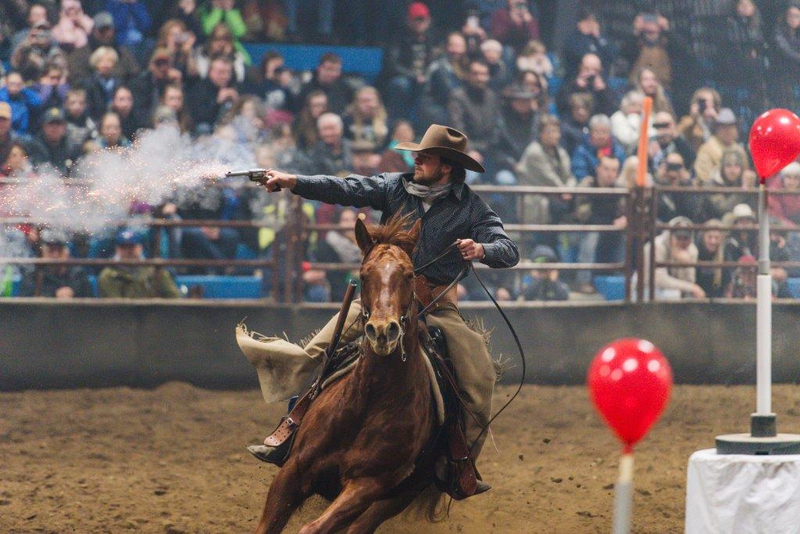 The Saskatchewan Equine Expo includes thrilling equine demonstrations, like mounted shooting. The 8th Annual Saskatchewan Equine Expo takes place February 14-17, 2019 at Prairieland Park in Saskatoon, SK. The event is produced by Prairieland Park Agriculture department in partnership with volunteers from Saskatchewan Horse Federation, the Western College of Veterinary Medicine and various equine breed groups. The event presents equine related lectures, presentations, demonstrations, entertainment and a full industry-related trade show. As a participant or spectator, you can experience the newest equine products, techniques and technology. 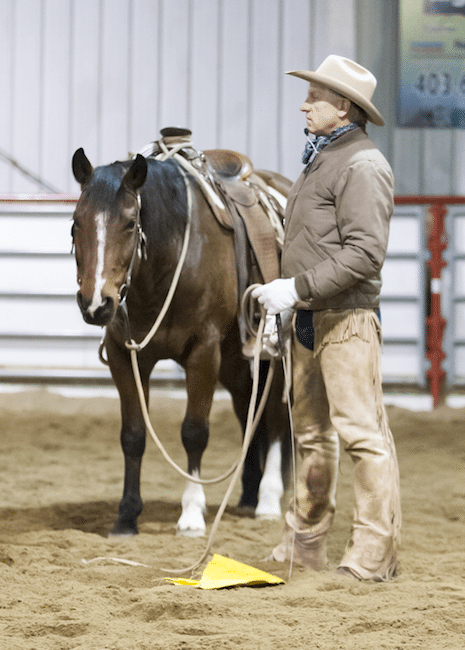 In 2019 enjoy a feature demonstration from Jonathan Field, a world renowned horseman and clinician. Field has been featured on national TV, in major equine publications, has authored a book titled ‘The Art of Liberty’ and was the recipient of the Jack Brainard Horsemanship award for overall horsemanship during the International colt starting competition “Road to the Horse”. The NAERIC Trainer’s Challenge also returns this year with trainers, Scott Todd, Jason Irwin and Amos Abrahamson vying for top honours in the colt starting. 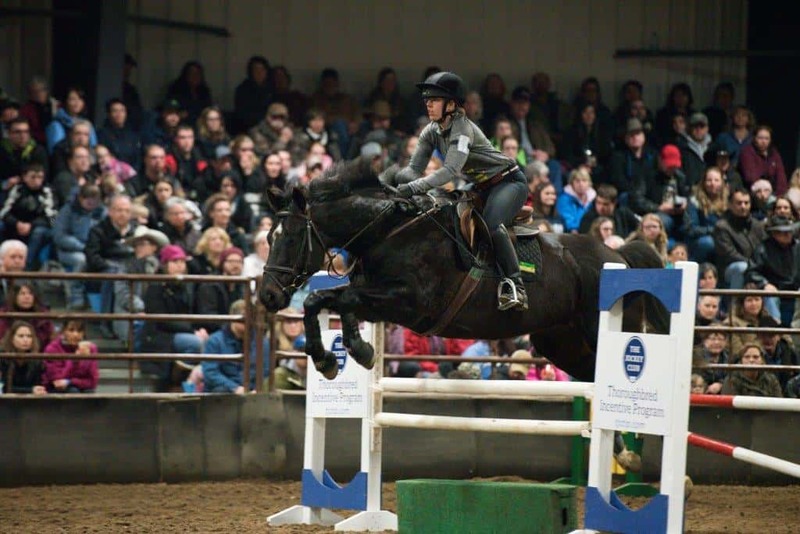 Other fun activities for the equine enthusiast include the Equine Extravaganza, Off-Track Thoroughbred Challenge and trade show. The NAERIC Trainer’s Challenge is an exciting colt starting competition with three top trainers from across Canada. The Off-Track Thoroughbred Challenge takes an English twist on the predominately western-dominated colt starting challenges. Thanks to Billie-Jean Duff for contributing both the photos and text for this post about the recent Buck Brannaman clinic held near High River, Alberta. See more of Billie-Jean’s work at Roughstock Studio. With regular frequency, I pop into the local video store to rent a copy of The Horse Whisperer, starring Robert Redford and Scarlett Johansen.The awe inspiring scenery illustrated throughout film, along with beautiful feats of horsemanship moves me to tears every time I curl up to watch it. As many of you know, Buck Brannaman played a significant role in the production of the movie, both behind the scenes, in addition to being Redford’s stunt double. The horse whisperer extraordinaire himself was in southern Alberta recently. 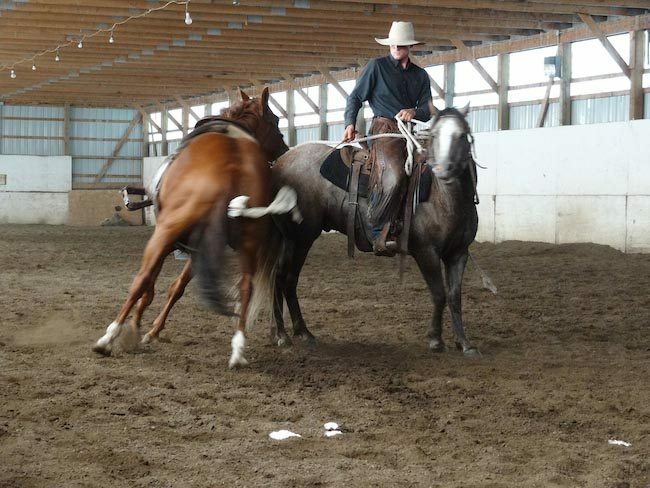 Held at the High River Agriculture Society’s rodeo grounds, located on the outskirts of High River, Buck Brannaman hosted a Horsemanship 1&2 clinic. Two groups of riders, 25 riders in each class over three days took part in the clinic, with Horsemanship 1 receiving instruction during the morning and Horsemanship 2 filling the afternoon time slot. 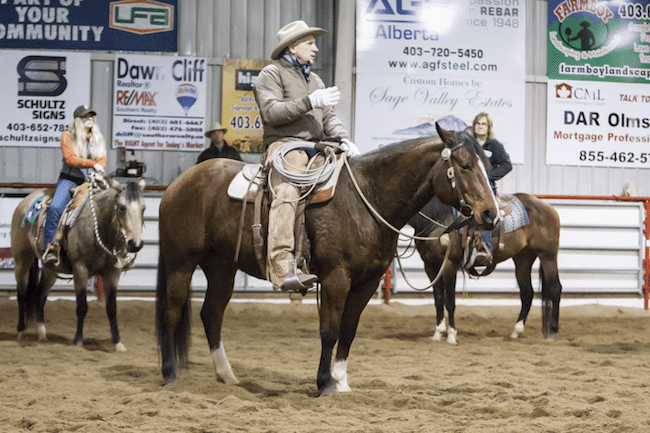 The clinic was sponsored by Denise & Keith Stewart, owners of Key Ranch, located southwest of High River. The clinic isn’t limited to horses with people problems, though. Spectators of all ages came out in droves, braving the almost blizzard like conditions to claim a piece of real estate in the bleachers, so they could listen to Buck coaching and addressing concerns that riders had with their mounts. 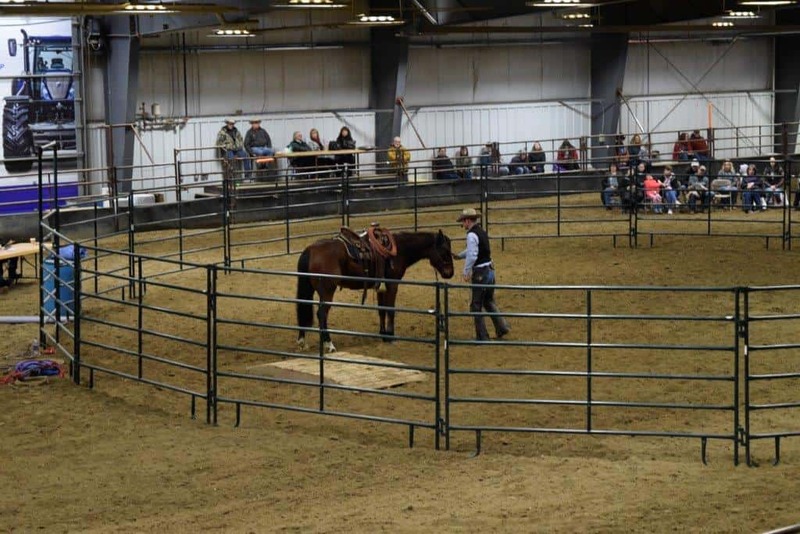 Comprised of mostly young horses, riders of both English and western disciplines participated in the school; they all had one thing in common, they were all in attendance to learn to understand and connect with their equine partners. On Soft Feel…It’s not about how much pressure you put on, it’s how good you are at taking it off. This phrase was used while talking about giving to the bit, or soft feel. You must be able to respond with the subtlest release so that the horse may give you. The release is the reward to the horse. On Backing Circles…With the young horse backing circles, a spectator inquires about the nose being tipped to the outside. Buck explains this is simply because he’s thinking ahead, for when he asks the horse to turn, moving forward out of the circle. It’s the progression to the next step, like looking to the third barrel while coming around second. Learn more sooner, you won’t have to correct more later. Do things correct from the start. Don’t rush the training process. You won’t have to spend time correcting problems in the future. No matter your level of horsemanship, arm yourself with a thermos of hot coffee, a cushion for the most uncomfortable bleachers, lots of pens or pencils, and plenty of paper to take notes. Don’t try to watch the progress of each participant, hone in on a handful of horses/riders to follow their progress. You will see significant improvements in both horses and their riders by day three. And, do observe Buck – after all, he’s why you’re there, right? Shortly after graduating from university, with a Bachelor of Commerce, Gregg Garvie headed to Australia to play professional hockey. He returned home to Alberta after almost a year to continue playing hockey, which he says, “never panned out”. He then had aspirations to become a veterinarian, and went to work at a feedlot alongside a vet there. He says he always sat back and watched the cowboys working, and training their horses, and decided that is what he really wanted to do. From that moment on, Gregg put everything aside to be a trainer and work with horses. Gregg has a very calming and gentle approach, and seems to have a “horse whisperer” type of demeanor when it comes to training. 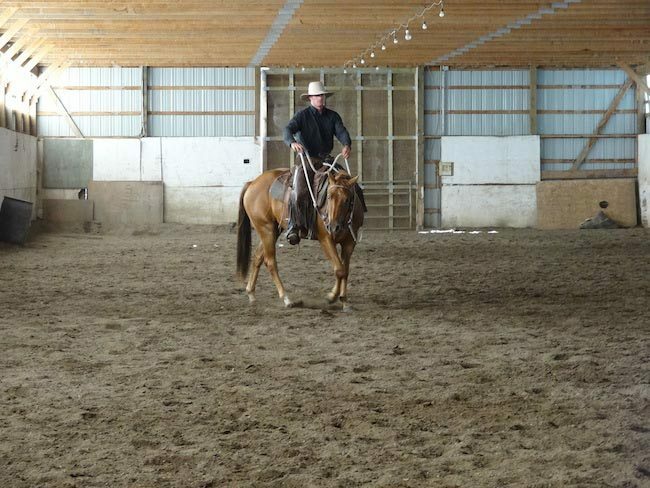 I have had the opportunity to watch Gregg with several horses, and he is great at what he does. But when talking with him, he certainly does not give himself the credit he deserves. He told me that, when he rides with great trainers, he considers himself a “rank amateur.” I had to laugh, as he was riding around on a pretty broncy colt at the time and getting along just fine. Gregg has devoted his free time to ride with Sid Cook, whom he considers to be a great mentor for himself. Gregg applies techniques he has learned from Sid Cook, Tom Dorrance, and Ray Hunt into his training program. He states there is so much truth to Tom Dorrance’s words: “Timing, Feel, and Balance”. Ground work with some flagging to gain control and get the horse moving freely. The horses that Gregg works with get to do a little bit of everything. It is not strictly arena work. He is not shy about heading out to the field, packing a rope, moving cattle, or jumping at any opportunity that might be good for the horse. Gregg uses a colt to take a stray yearling back out to pasture. The most important thing, in his mind, when Gregg works with a horse, is that it is not tight and can cross over with their hind end. “Pretty much all the time, when they step off the trailer, you know right away. About 90% of the horses I get, or ‘problem horses’ that come to me, it seems that they are not freed up and have no idea how to use themselves properly”. Gregg achieving the hind end control he likes for a horse. 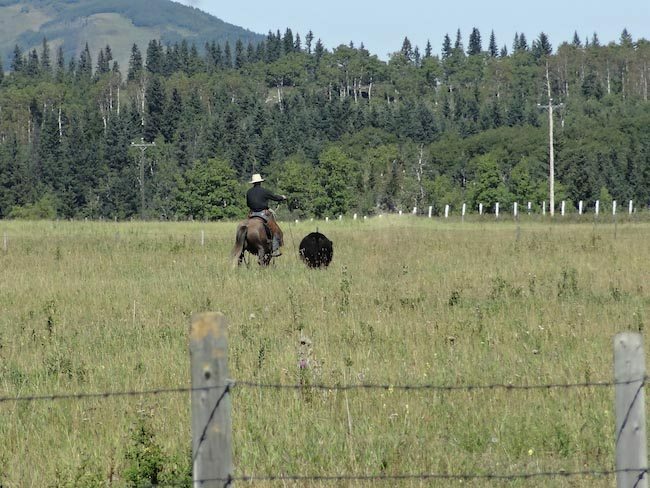 Gregg trains out of his homeplace near Priddis. You can find him on Facebook at Gregg Garvie Horses.